Victory! 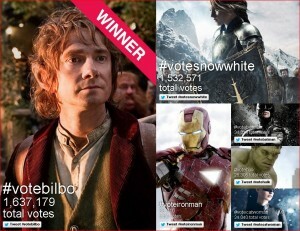 We have #votebilbo victory! The MTV Movie Awards just announced that Bilbo beat out all the other contenders, including Iron Man, The Hulk, Catwoman, Batman, and Snow White, for the coveted “Best Hero” award. A massive fan effort that spanned continents lead to Bilbo’s victory by a margin of more than 100,000 votes. Using the hashtag #votebilbo, fans cast their votes on Twitter and Instagram and forged a dedicated fellowship committed to showing the world that even the smallest person can change the course of the future. With more than 1.63 million votes, Bilbo was the clear winner, much to the chagrin of legions of Kristen Stewart and Twilight fans who gave our little hobbit a run for the money. In addition to tweeting, fans created thousands of images that they uploaded to Instagram to share their love for our favorite hero. We’ll have a gallery of some of our favorites online soon.